In March 2014, the Saints announced an agreement with The Greenbrier resort to hold the team's training camp at the hotel, in White Sulphur Springs, West Virginia, for three years beginning with 2014. The hotel has committed to build three football fields and other facilities for the Saints, at an estimated cost of $20–25 million, adjacent to its sports medicine facilities. The project will be partially subsidized by tax breaks recently approved by the state legislature. The relationship between the hotel and the Saints reportedly grew out of a visit by Saints head coach Sean Payton to the 2013 Greenbrier Classic golf tournament to play in its pro-am competition and then to serve as caddy for his friend, PGA Tour golfer Ryan Palmer. This was the Browns' first home opener win since 2004, and also marked Johnny Manziel's NFL debut. The defense, primarily by rotating DB's Tashaun Gipson, Buster Skrine, rookie Justin Gilbert and Joe Haden, were able to neutralize TE Jimmy Graham and QB Drew Brees for almost the entire first half. Rookie Terrence West, who had 2500+ all-purpose yards at Division II-school Towson Univ., ran for almost 70 yards and one TD. Billy Cundiff hit the game-winning FG as time expired. 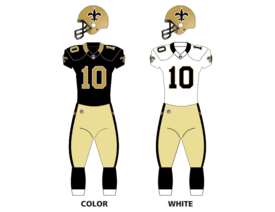 ↑ Kate White & David Gutman, "NFL's Saints to train at The Greenbrier: Resort constructing 3 fields, facilities for Super Bowl XLIV champs", The Charleston Gazette, March 13, 2014.